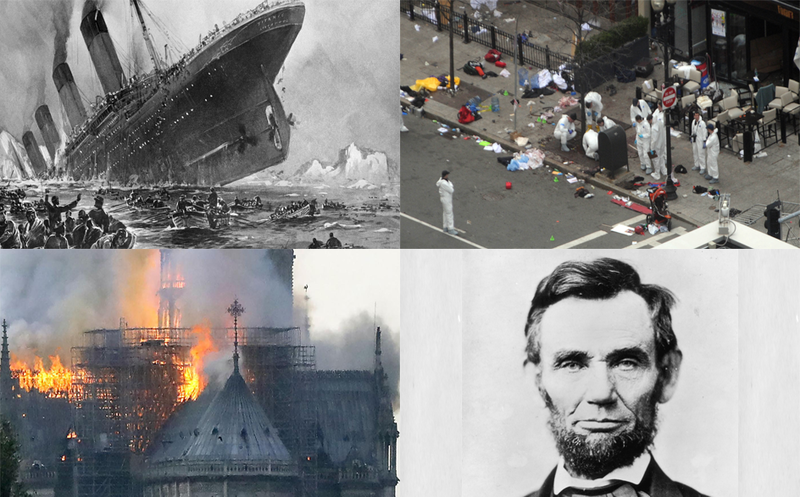 April 15 has historically been a day for bad news because it's the day President Abraham Lincoln was shot and killed, the day the Boston Marathon Bombing killed three people and wounded 260 others, and it's the day the Titanic sank to the bottom of the Atlantic. And now, history proves to repeat itself as a massive fire destroyed the roof of Notre Dame Cathedral in the heart of the French capital. (Meredith/AP) -- A massive fire engulfed the roof of Notre Dame Cathedral in the heart of the French capital Monday, toppling its spire and sending thick plumes of smoke high into the blue sky as tourists and Parisians watched in horror from the streets below. Flames and smoke are seen billowing from the roof at Notre-Dame Cathedral in Paris on April 15, 2019. - A fire broke out at the landmark Notre-Dame Cathedral in central Paris, potentially involving renovation works being carried out at the site, the fire service said.Images posted on social media showed flames and huge clouds of smoke billowing above the roof of the gothic cathedral, the most visited historic monument in Europe. TOPSHOT - Smokes ascends as flames rise during a fire at the landmark Notre-Dame Cathedral in central Paris on April 15, 2019 afternoon, potentially involving renovation works being carried out at the site, the fire service said. And as tragic as this is, April 15 has historically been a day for bad news, according to History.com. Three spectators were killed, and more than 260 others were injured when two bombs went off near the finish line of the Boston Marathon. 107 years ago, at 2:20 a.m., 2,200 passenger and crew were subjected to the cold, unforgiving waters of the Atlantic Ocean as the Titanic broke in half, sending the bow and stern plummeting to the bottom of the sea. April 15 also goes down in infamy as the day our 16th president was assassinated by John Wilkes Booth in a balcony at Ford’s Theater. President Lincoln lived for nine hours after being shot before ultimately succumbing to the severe wounds he was inflicted with. After shooting Lincoln, Booth jumped down from the balcony and broke his leg. He escaped from the theater and sought a doctor to treat his wounds with his accomplice, David Herold. Booth found refuge with Confederate sympathizers and hid at a farm, but Union soldiers eventually found Booth. He refused to leave the barn he was hiding in, so it was set on fire, but he was shot and killed while inside the burning building.